If you're a Milwaukee teacher, your problems are no longer limited to the classroom. The school district has now determined that you won't be able to get Viagra on your prescription plan. In other words, they're doing to teachers something they don't want to encourage teachers themselves to do. This is a tough break, as I have no idea what the hell else there is to do in a place like Milwaukee. I mean, sure, there's what made Milwaukee famous, but unless you're a politician, it's not enough to be full of Schlitz all the time. My advice is this--watch out New York. Viagra is on the firing line. Confidential sources advise me that Schools Chancellor Joel Klein is upset with it and advocating its removal from the prescription plan. Apparently, the chancellor experimented with the little pills, but they just kept making him taller. 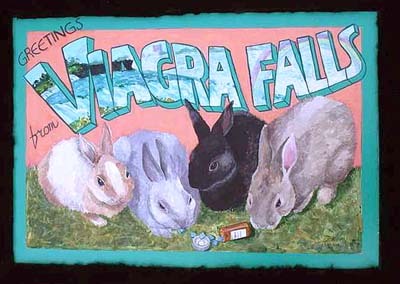 It appears Viagra's days may be numbered.